RAAAAWRRRRRR and also a Beret | Stitch, Brinn, Stitch! That’s right, folks, dinosaurs! I’ll be selling the pattern for these as well and will have several options for different dinos. The Triceratops is all written up, and I’ve got to figure out how to do the T-Rex so it actually looks like a T-Rex. I’ve yet to muddle out the stegosaurus, but that’s happening too. If you’ve got suggestions or requests for other dinos, just let me know! I want to have as many options as possible for these guys. Like the sharks, the pattern will be in both adult and child sizes. 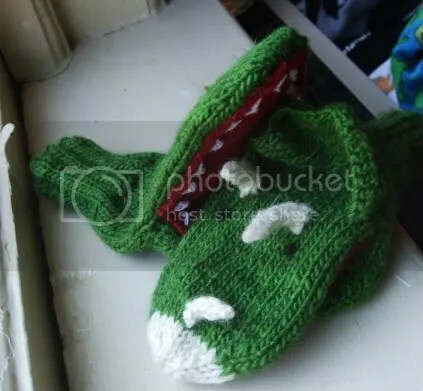 I hope to get it up before the month is out, resulting in a pattern that will make perfect holiday gifts–I did the actual knitting of these (disregarding fiddling and figuring time) in like, three days. That’s a Classic Elite pattern, A Slouch for All Seasons, done up in Knit Picks Wool of the Andes left over from the sweater vest. I should have enough yarn, but it’ll be close. I’d be more worried if I hadn’t cut out two pattern repeats and only cast on 80 instead of 100. This hat looks to be done tomorrowish. 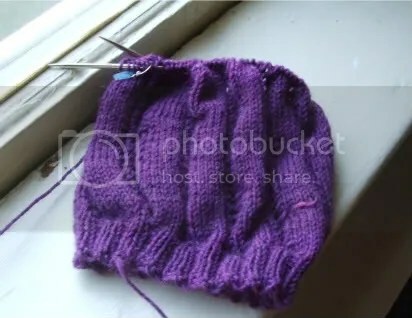 I’ve thrown my hat back into the ring for the Ongoing Wish Swap and claimed someone for a knit hat, so that’s coming up on the radar. I’m not doing Christmas gifts this year (except for my sister, which is a story for a later date). Stay tuned!